Superman has been in the news recently. 2013 marks the 75th anniversary of the comic book superhero, and Man of Steel, a new Superman movie, is scheduled to open in theaters on June 14. While Superman fans anxiously await for the movie to premiere, it's the perfect time to read Boys of Steel by Marc Tyler Nobleman. The narrative nonfiction picture book follows the lives of Jerry Siegel and Joe Shuster, co-creators of Superman. The two friends grew up in Cleveland during the Great Depression. Jerry was a reader, a dreamer and a writer while Joe was a budding artist. Together the pair created a new kind of superhero. "This hero would be an alien. Not a slimy green giant with two hundred eyes who prowled the moon and snacked on astronauts. Rather, an alien who protected humans. An alien who even looked human. An alien who came from far away and now lived on Earth. The real Earth, the Great Depression Earth." When the Superman comic was published in 1938, it "was an instant hit." It's evident that Nobleman did his homework for this book. Selected sources are included on the copyright page, and all dialogue used in the story came from interviews with Joe and Jerry. Nostalgic watercolor illustrations reflect the 1930s setting. MacDonald effectively weaves comic book elements into the illustrations. Readers should be sure to read the author's note. Nobleman details a lengthy story of how the co-creators of Superman sued DC Comics for rights to Superman. Jerry and Joe lost their court case, and "their names were removed from Superman comics." The battle for the rights to Superman and a percentage of the profits dragged on for decades. 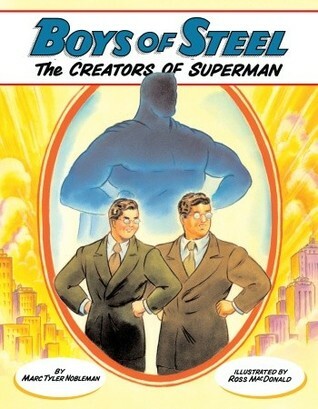 Librarians looking to attract more readers to nonfiction should add Boys of Steel to their collections. Fans of comics, young and old, will be quick to scoop up this treasure. Common Core IRL: In Real Libraries- Frogs!